Something very special ended up on my windowsill–a cocoa pod! Just in time for Valentine’s Day. I decided to see what takes to get from pod to cocoa. After all, chocolate is king this time of year–though it usually comes in the shape of a heart! 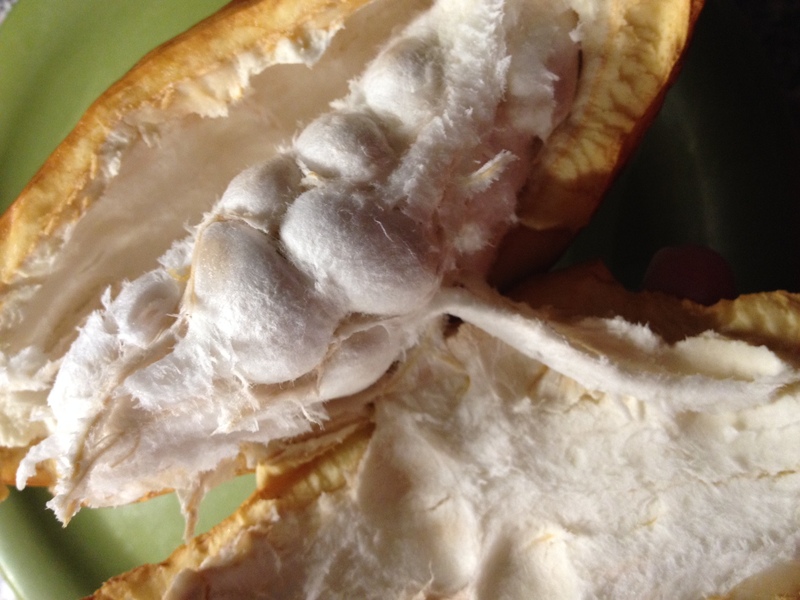 Here’s the cocoa pod that was on my windowsill this week. Let’s experiment! The most fun I had was probably as I cut into the pod. The inside looks like a fuzzy experimental corn cob, and smelled very much like the inside of a pumpkin. In following the process I gathered up the beans to let them ferment. This stops them from germinating and starts the flavoring of the nib. 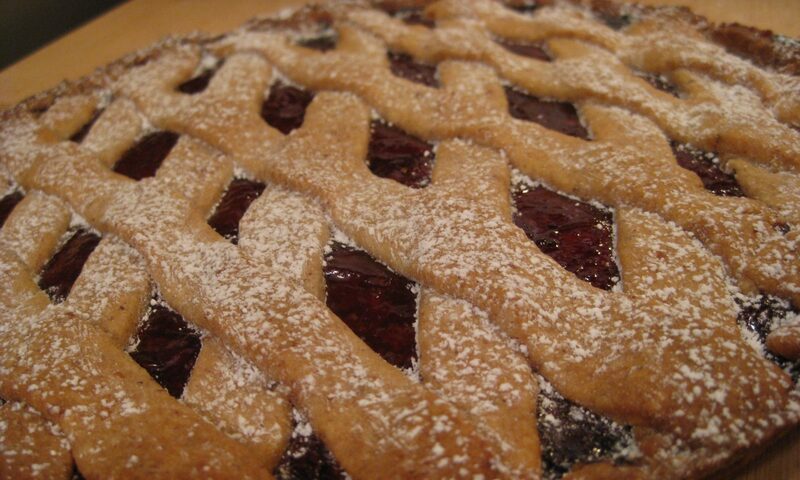 The white stuff on the outside helps with this, and in six days they are ready to dry. A couple more days and they are dry, and ready for roasting. This is similar to roasting coffee, and a key part of the process of giving the nib its final flavor. I think by now most everyone has had cocoa nibs in fancy candy bars or as a dessert garnish. The ones I toasted had the familiar little bitter crunch of nibs I’ve eaten before. I ground the nibs in my kitchen pestle and then I had my cocoa powder. Long preparations like these with so many steps always make me wonder how people discovered that we could eat the final product in this particular way. Accident or not, you gotta love the inquisitive mind of those people over two thousand years ago, the first chocolatiers! It was definably worth cutting that pod open. Here is a cocoa nib – a piece of the bean after fermentation and drying. 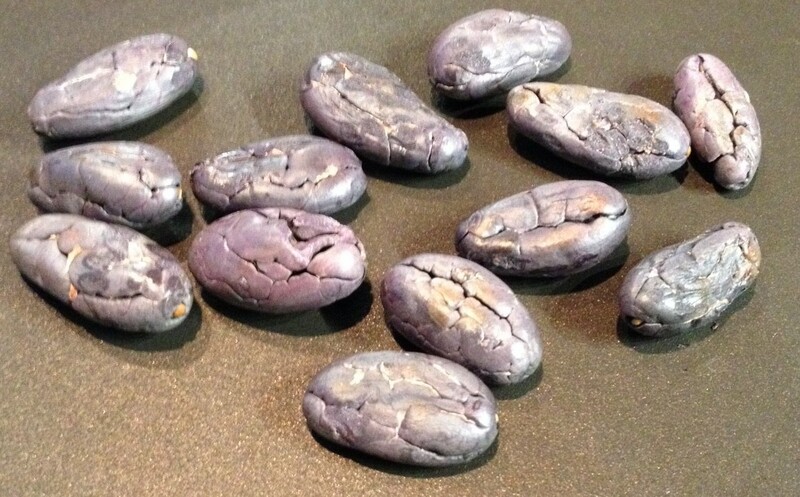 This is what the beans look like after they are toasted. 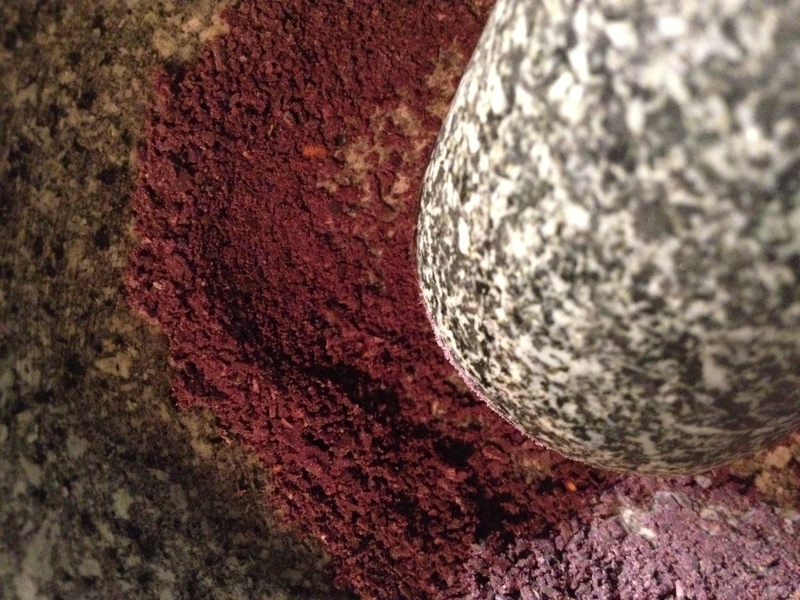 I used my mortar and pestle to grind the nibs into cocoa powder.